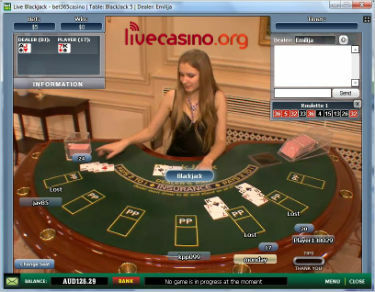 Pictured is live baccarat streamed from the Playtech Euro studio. Player (1:1), Banker (0.95:1), Tie (8:1) and Pairs side bets are offered. 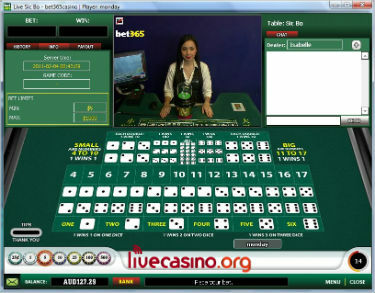 Also available at bet365 are baccarat games streamed from Playtech's Asian studio. 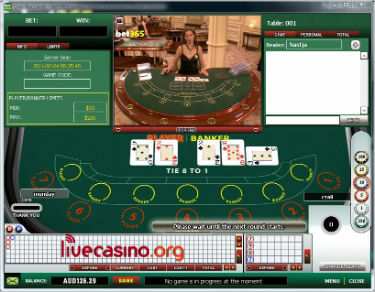 These games offer Pairs, In-running and progressive jackpot side bets. Blackjack dealt from an 8-deck shoe with re-shuffle after approx. 4 decks. 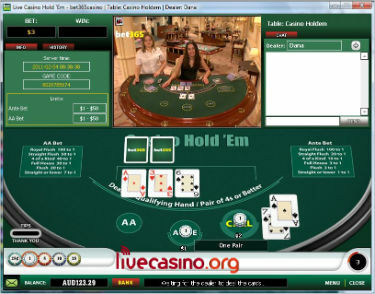 Game pictured is streamed from Playtech's Euro dealer studio. Image quality and audio (for dealer chat) are outstanding. Chat to the dealer, customize your view of the dealer/wheel and studio floor. This is a player versus the house poker game. Beat the dealer's qualifying hand and you win even money on your Call Bet and a payout of up to 100:1 on your Ante. This is a live gaming option that is hard to fault. Game range and quality is outstanding and ancillary support and services are excellent. You'll need a reasonable (1.2Mbps+) connection speed to get the full benefit of the games' high definition video stream.